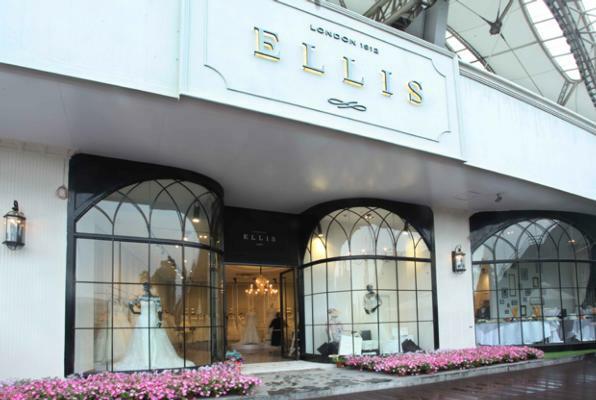 In addition to its vast network of stockists in the UK and mainland Europe, Ellis boasts some 70 retail outlets in the US that carry its bridal label as well as bridesmaid/occasiowear collection Kelsey Roses. “We believe we are bringing something different to the market across the pond – a London style that resonates with US brides desiring originality in design and expertise in craftsmanship from a brand that recently celebrated its 100th anniversary. The retailers really value the strong customer service team that we have built up within the US, who are dedicated to servicing and quality control alongside very strong promotion through national advertising,” says Regine Ellis, the driving force behind the company. An art-deco-style exterior fronts a beautiful 3,000-square-foot store that houses not only the collections but also an exhibition of Ellis’s imagery to take visitors on a journey through the brand’s design heritage. As a definitive nod to its British origins, the store even offers classic British afternoon tea and special invitations are sent to customers for ‘high-tea weekends’. There’s a big marketing and development story here and one that we can all learn from. It’s to do with starting from a very firm base, investigating possibilities, and investing in realising a dream. Read more in the November/December issue of Bridal Buyer.